I received an email from an editor a little while ago. She said the piece I submitted “holds promise,” and/or “has merit,” but she didn’t think it was quite right for her publication at this time. I was lucky: she listed some reasons why, and how I might fix the flaws. If you’re a writer, I’m sure you’ve experienced the same thing. It’s already as good as you can make it, right? You’ve already given your best. I suspect most editors know exactly what to do to fix the stuff I send them, but they have to be careful how much they say, because it’s not theirs—it’s mine. I am the writer. It’s my journey, not theirs. Whatever the solution is, it must come from deep within me. They want me to impress them, challenge them, and surprise them. I have found this to be the scariest place, because at this point in the process, I doubt my ability to achieve that. It would devastate me to keep digging and discover there’s nothing there. So if I abandon any piece, it’s usually here. The old adage about the miner who gives up after years of digging when he’s only two feet from the vein of gold only buttresses a person’s resolve for so long. Today, I’m glad to say I experienced a breakthrough. I made a significant change to my story based on the advice that in its current iteration, my ending didn’t match the beginning. Thing is, the new ending seems obvious now, like, “Of course, naturally. It only makes sense.” But I couldn’t have imagined this significant change off the top of my head. It only occurred to me after sitting with the story for many days. Weeks, even. Is this new bit what I will polish up and resubmit? I like it a lot, but I don’t know. Even if it isn’t the kind of ending that will sell the story eventually, I celebrate, because what happened today represents progress in my writing life. It turns out there is something deeper in me after all. I can have faith in the creative process. If I sit with it long enough, the answer will appear. Is that my problem? Impatience? I’m too much in a hurry, down there at rock bottom. 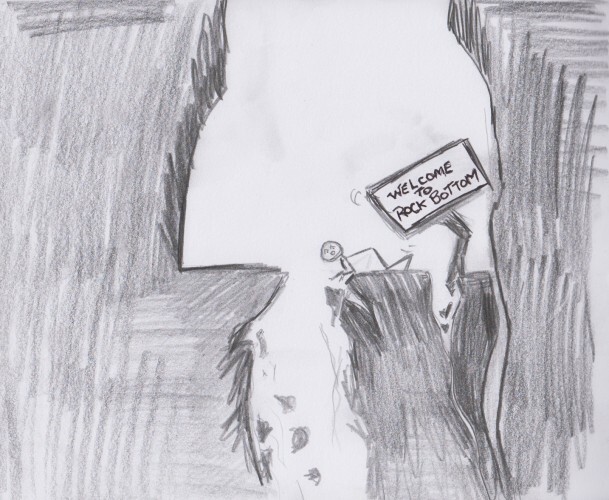 (Chances are it’s not rock bottom, anyway. There are deeper places still.) Even though it’s not a comfy place, I won’t be afraid of the dark anymore. What I find down there might push me up all the way to the surface. This entry was posted on Friday, July 8th, 2016 at 5:45 PM and is filed under Writing. You can follow any responses to this entry through the RSS 2.0 feed. You can leave a response, or trackback from your own site.